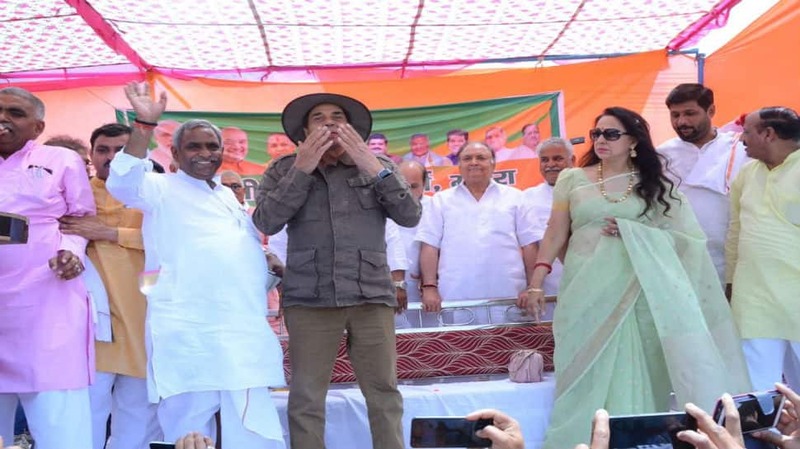 While Hema Malini’s celebrity status is good enough to draw people to her campaign rallies, the BJP candidate from Mathura on Sunday was joined by husband and veteran Bollywood actor Dharmendra who appealed for votes on her behalf. Dharmendra joined Hema Malini in Mathura and tried to connect with the large number of people gathered to catch a glimpse of the star couple. “Vote for Hema Malini. Without your support, we will not be able to take even a single step towards the development of the city,” he was quoted as saying by news agency ANI. The actor was seen waving towards people gathered and said he was confident that people of Mathura would once again put their faith and trust in his wife this election season. Hema Malini had won from the Mathura constituency in 2014 Lok Sabha election – defeating Jayant Chaudhary of RLD by over three lakh votes. This year too, she has hit the campaign trail in earnest and has appealed to people to come out in huge numbers and vote for her. While there have been some controversies along the way, the BJP has largely shown that it believes in Hema Malini’s political acumen and abilities to clinch the seat yet again.